Even though Contra was legendary on the 8- and 16-bit consoles where it initially appeared, the series seemed to have lost its way when it transferred awkwardly to the Playstation. Fortunately, Konami seems to have learned from their mistakes because Contra: Shattered Soldier for the PS2 restores the play mechanics and challenge that made the original so great. Read on and find out why fans of the classic series will be thrilled with this uncompromising blast from the past. With such a crowded field of remakes and sequels coming out, Konami's excellent Contra: Shattered Soldier is probably going to be one of the biggest sleeper titles of the year. While the last few installments have been disappointing, this latest installment restores the glorious gameplay and goes back to its roots with tight 2D action and a classic feel. This shouldn't be surprising, since Konami has returned the series back in the hands of the original creators. You'll immediately be able to tell that it has that classic Contra feel and gameplay though there are some cool twists that keep things fresh without losing the classic feel. 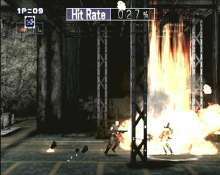 No game in the series has ever looked better with excellent light sourcing making for bright, glowing bullets. The bleak post-apocalyptic design is enhanced with cool background animations that make things much cooler. The animation and design is brilliant and gives Contra a cohesive look that fits together nicely. Even though the look is dark and with a somewhat rusted tint, it's not excessively so and doesn't hurt the game. 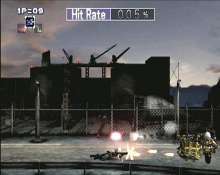 In fact, it makes the explosions, enemy spotlights and gunfire that much more dramatic. The classic approach is enhanced with a great looking engine. 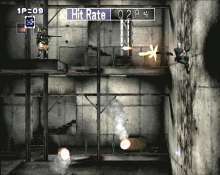 Most of the game is a hybrid of traditional 2D style with some 3D objects. What's really awesome is that there are some areas in the game where the camera perspective changes dramatically, which adds to the intensity and excitement of the experience. It sounds lame on paper, but we especially liked the snowboarding sequence with the giant alien snake which was inventive and cool. Shattered Soldier returns to the classic feel and level configuration of the older games, which should definitely please older games. Veterans of the classic shooters will enjoy the fact that the spraying bullets and spinning jumps are exactly as you remember them. You can still climb on walls or hang from objects, shooting in one direction while moving in another, which is really cool. The game's excellent level designs are challenging and elaborate. You'll need a lot of skill to beat them in one shot, but you can continue from the half-way mark in some areas if you run into trouble. While there are only 5 levels in Shattered Soldier, the difficulty is extremely high. 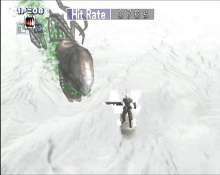 Some of these areas are fairly standard run and gun affairs, while others consist entirely of a boss battle which should keep players interested throughout. Contra Shattered Soldier's fantastic controls are very much like previous games, and are just as tight and responsive as you remember them, making for gourmet thumb candy. You can use either the standard D-pad or the analog controller to control your character, though we found the D-pad surprisingly more intuitive than the traditional cross configuration. You can cycle betwen three different weapons including a flame thrower, grenades and standard blaster fire at any time using the shift button,. These weapons can be charged up for more devastating attack. The biggest difference in the controls is that you can use the shift buttons on the PS2 controller to lock yourself or your weapons direction in place. It's important to get the hang of it early on, because some of the boss encounters are impossible to win unless you are food at doing this. 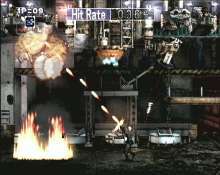 At the start of the game, there are two selectable characters, one male and one female. It really doesn't matter which one you choose, since they seem to be evenly matched. One difference from previous games is that in the two-player mode, both characters can play co-operatively to do twice the damage. One interesting aspect is that instead of using points, you see a bar at the top of the screen that indicates your hit percentage. This tells you how you're doing but doesn't apply with all enemies, so it pays to figure out which ones matter. Achieving a high hit-ratio score means you can unlock extra levels. It's not as easy to do this as it sounds, because many enemies are extremely difficult to beat but it adds to the overall enjoyment and fun of Shattered Soldier. It's hard to believe in late 2002, but Shattered Soldier only offers five levels of play. At first glance, this seems like a rip-off, especially when four of these can be selected from the main menu right off the bat. There are two levels of difficulty offered, Normal and Hard and the biggest difference here is the number of lives and continues you get. Contra is one of those rare titles that requires you to have the skills to complete it, so you'll need a lot of practice. Memorizing and anticipating the locations of enemies and their bullets goes a long way in helping you get through the levels. Even then you'll need a lot of skill and patience. However, one area that's bound to frustrate even good players are the boss confrontations. These enemies are incredibly difficult no matter how many times you battle them and take a mixture of luck and patience to beat. Remember, however that the original game's weren't cakewalks either, so this carries on the tradition. Shattered Soldier is the great remake Contra fans have waited so long for, and a perfect example of how to do it right. There have been some missteps in trying to convert the series entirely into 3D. Fortunately, Konami was smart enough to leave the classic 2D look and play mechanics of the original intact. Sometimes, a game can be over-designed, but the new elements seem to be a natural evolution of the series and seem organic to the classic play mechanics. It doesn't hurt that Contra: Shattered Soldier has some of the most impressive boss characters seen to date. What makes the game so addictive despite the relatively short levels is the replay value. Its fun to go back again to increase your hit-ranking is rewarding. Contra succeeds precisely because it's squarely aimed at fans of the original series, not casual players, or those looking for fancy 3D effects. It's unashamed of being a great, tough Contra game and that's what makes it great. Thanks to this uncompromising approach, Contra: Shattered Soldier should go a long way in restoring the reputation of this long-running series.